Saturday Funds like the one advertised on this leaflet were set up to encourage communities to show support for local voluntary hospitals. Saturday was traditionally the day on which charity fundraising took place, hence the name of this society. The most popular and visible form of fundraising at this time was street processions: collectors on foot were accompanied by decorated horse-drawn floats. 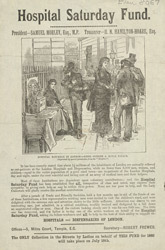 By the middle of the century, charities were carrying out door-to-door collections, and some even set up large donation boxes such as the one advertised here.